Men, do you dread holidays because you don’t know any stocking stuffer ideas for women? Want to communicate to her you’re up on all the trends in fashion, even if you’re really not? We can help you look great in the eyes of your special someone because we’re offering six stocking stuffer ideas for women. Although these items are small enough to fit in a stocking, they pack a powerful punch in the gift arena. Whatever the gift costs monetarily, each one will communicate thoughtfulness, intentionality, and might even win you some extra time watching the football game on Christmas Day. If you’re looking for other gift ideas, here are some non-food neighbor gift ideas. 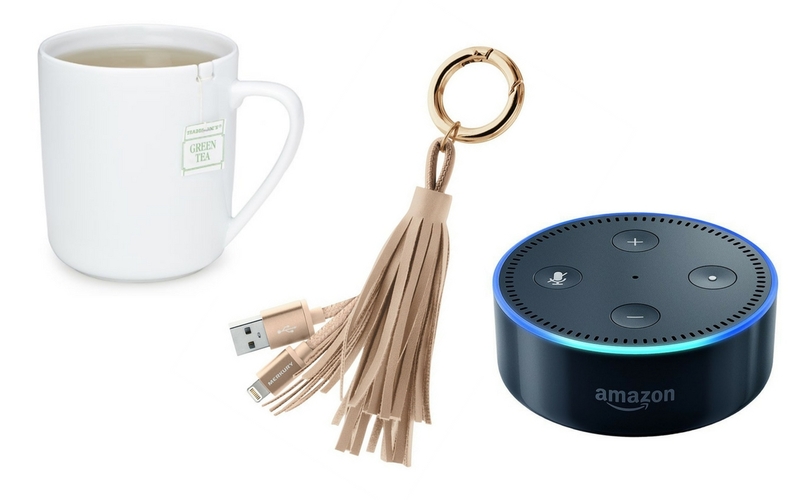 This gift says you never want her phone to run out of charge, plus you have the inside scoop for purse fashion with the faux leather tassel. Each cable is Apple MFi certified, containing a verified serial number and authorization chip to ensure compatibility with your Apple components. Bring her a fresh, hot cup of tea in her new, crisp, clean white mug. The small tab on the side allows her to tie her teabag onto her mug where she never will have to fish out that bag in hot liquid again. You’ll be sure to stay out of hot water with this gift. She’ll find the gift–and you–epically charming with a new bracelet and Christmas charms from Pandora’s Winter Collection. The 2017 Christmas stocking is a must-have, and you also can choose from beads and other beautiful charms, from a golden snowflake to a sweet candy cane and even adorable Christmas polar bear. Does she love Disney? Pandora also offers numerous Disney-themed charms as well. Go for Cinderella’s Pumpkin-Coach charm. With these gifts, you’ll definitely become her Prince Charm-ing. Lush is all the craze right now, given the company’s longstanding commitment to making ethically-sourced, all natural skin and hair products without testing on animals. She’ll feel cozy soaking in the Christmas Sweater bath bomb with its blend of clove bud, coriander seed, and lemon oils. Another option is the Snowdrop gift set that includes the Saucy Snowcake bath soap that soothes winter skin and has a warm almond scent to it. The Dream Cream body lotion not only softens her skin, she will feel cozy and relaxed all snuggled beside you after using this delightful, rich lotion. Choose from either of these smaller interactive devices that fit nicely into her stocking. With her voice-controlled commands, she can play music, check the weather, and even find out how much tickets cost to the next NBA game (for you, of course).